Amylin (islet amyloid polypeptide) is a hormone with suggested roles in the regulation of glucose homeostasis, gastric motor and secretory function and gastroprotection. In the gastric mucosa amylin is found co-localised with somatostatin in D-cells. The factors regulating gastric amylin release are unknown. In this study we have investigated the regulation of amylin release from gastric mucosal cells in primary culture. Rabbit fundic mucosal cells enriched for D-cells by counterflow elutriation were cultured for 40 hours. Amylin and somatostatin release over 2 hours in response to agonists were assessed. Amylin release was significantly enhanced by activation of protein kinase C with phorbol-12-myristate-13-acetate, adenylate cyclase with forskolin and elevation of intracellular calcium with A23187. Cholecystokinin (CCK), epinephrine and glucagon-like peptide-1 (GLP-1) each stimulated amylin release in a dose-dependent manner. 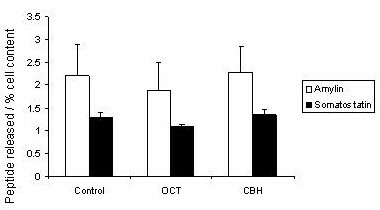 Maximal CCK-stimulated release was greater than either epinephrine or GLP-1, even when the effects of the latter two were enhanced by isobutylmethylxanthine. Stimulated amylin release was significantly inhibited by carbachol (by 51–59%) and octreotide (by 33–42%). Somatostatin release paralleled that of amylin. The cultured D-cell model provides a means of studying amylin release. Amylin secretion is stimulated by receptor-dependent and -independent activation of Ca2+/protein kinase C and adenylate cyclase pathways. Inhibition involves activation of muscarinic receptors and auto-regulation by somatostatin. Amylin (islet amyloid polypeptide) is a 37-amino acid peptide predominantly expressed in the pancreatic Islets of Langerhans [1, 2]. Amylin has also been localised throughout the gastrointestinal tract  and in the brain . Much recent work has focused on the physiology of pancreatic amylin; the peptide appears to be co-stored and co-secreted with insulin in pancreatic B-cells [5, 6], a smaller proportion is co-localised with somatostatin in pancreatic D-cells . Amylin is believed to function as a hormone regulating glucose homeostasis. Amylin inhibits basal and insulin-stimulated glycogen synthesis in rat skeletal muscle [8, 9]; it inhibits insulin, somatostatin and glucagon secretion from isolated pancreatic islets and intact perfused pancreas and it reduces post-prandial glucagon and insulin secretion [10–12]. Amylin may also contribute to glycaemic control by slowing gastric emptying . It addition to these physiological roles, amylin is believed to play significant role in the pathogenesis of diabetes mellitus. It is the major component of the amyloid deposits in the islets of patients with non-insulin dependent diabetes mellitus [1, 2] and deficiency of amylin may contribute the failure of glycaemic control typical of insulin-dependent diabetes  and in animal studies amylin itself appears to induce insulin resistance . A variety of physiological effects on the gastrointestinal tract have also been described. Parenteral administration of amylin has an anorectant effect , in addition to significantly reducing gastric emptying . A protectant action against reserpine-, and serotonin-induced gastropathy has been described . Intravenous amylin is a potent inhibitor of basal, pentagastrin and 2-deoxy-D-glucose stimulated gastric acid secretion in the rat  and amylin reduced acid secretion in the isolated mouse stomach preparation . A stimulant effect on serum gastrin has also been reported, although this may have been secondary to the inhibition of acid secretion . In keeping with these actions amylin-binding sites have been detected in rat gastric fundic mucosa . Within the gastrointestinal tract amylin appears to co-localise with other gastrointestinal peptides. Using in situ hybridisation, immunofluorescence and immunocytochemistry, Mulder et al showed that amylin predominantly co-localised with somatostatin in the D-cells of rat and mouse antral mucosa and rat fundic mucosa . A minority of amylin co-localised to separate populations of gastrin-containing cells in the antrum and PYY-containing cells in the fundus. Studies in PDX-1 deficient mice (which fail to develop G-cells) demonstrated no alteration in gastric amylin expression, confirming predominant expression of amylin within D-cells . These data showing the presence of amylin and amylin receptors, coupled with the pharmacological effects, suggested that amylin might have a paracrine and/or endocrine regulatory and pathophysiological role in the gastric mucosa. However there are no studies exploring the processes involved in gastric amylin secretion. Such data are a prerequisite for further understanding of gastric amylin physiology. Primary cultures of gastric and intestinal endocrine cells have been utilised to examine the physiological and pathophysiological control of several gastrointestinal peptides including gastrin, somatostatin, glucagon-like peptide-1 (GLP-1) and cholecystokinin (CCK) [24–30]. The co-localisation of amylin with somatostatin makes the gastric fundic D-cell preparation a useful model to examine the control of amylin secretion at the cellular level. In this study we have examined receptor-dependant and receptor-independent regulation of amylin secretion from cultured rabbit gastric fundic mucosal cells. Cholecystokinin, glucagon-like peptide-1 and epinephrine stimulated amylin release in a dose dependant manner and the muscarinic receptor agonist carbachol and somatostatin receptor agonist octreotide inhibited amylin release. Somatostatin and amylin release occurred in parallel. To initially assess whether amylin release could be detected from the cultures of rabbit fundic cells, potent receptor-independent stimuli were used  The total cell content (TCC) of amylin in the cultured cell preparation (801 ± 151 fmol/well) was approximately 4 to 5-fold lower than that of somatostatin (3 768 ± 1325 fmol/well). Significant stimulation of amylin release occurred with the active phorbol ester (phorbol-12-myristate-13-acetate, PMA) which activates protein kinase C (PKC), activation of adenylate cyclase with forskolin and elevation of intracellular calcium with the ionophore A23187 (Figure 1). The phorbol ester was the most potent stimulant, leading to 8.5 fold increase in amylin release (basal release 2.14 ± 0.8% increasing to 18.5 ± 1.4% of TCC). Forskolin increased release 3.3 fold (maximal release 7.2 ± 1.4% of TCC) and A23187 by 1.8 fold (3.8 ± 0.5% TCC), these were markedly less potent than PMA. 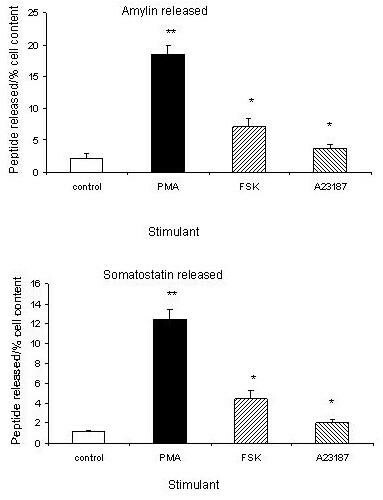 There were no significant differences between the patterns of somatostatin and amylin release (Fig. 1). Receptor-independent stimulation of amylin (top) and somatostatin (bottom) from cultured D-cells. Cells were stimulated with phorbol-12-myristate-13-acetate 100 nM (PMA), forskolin 10 μM (FSK) and A23187 1 μM for 2 hours. Results expressed as % of cell content of peptide released, mean ± SEM, ** P < 0.01 vs. control, * P < 0.05 vs. control. Previous studies have demonstrated that CCK is a potent stimulant of somatostatin release . This was confirmed here. CCK dose-dependently stimulated release of amylin from the cultured cells (Figure 2). Maximal stimulation, a 2.75 fold increase, 2.1 ± 0.7% basal release increased to 5.9 ± 0.8% TCC, occurred with CCK 10 nM. A similar dose response pattern was seen for CCK-stimulated somatostatin release although maximal release was relatively higher for somatostatin (4.4 fold, 1.1 ± 0.1% to 5.2 ± 0.7% TCC) than amylin (Figure 2). CCK-stimulated amylin (top) and somatostatin (bottom) release from cultured D-cells. Cultured mucosal cells were stimulated with CCK for 2 hours. Results expressed as % of cell content of peptide released, mean ± SEM, * P < 0.05 vs. control. Activation of adenylate cyclase-coupled receptors with either epinephrine or glucagon-like peptide-1 led to a dose-dependent small increase in both somatostatin (maximal increase 1.44 and 1.35 fold respectively) and amylin release (1.36 and 1.25 and fold respectively) (Figures 3 and 4). 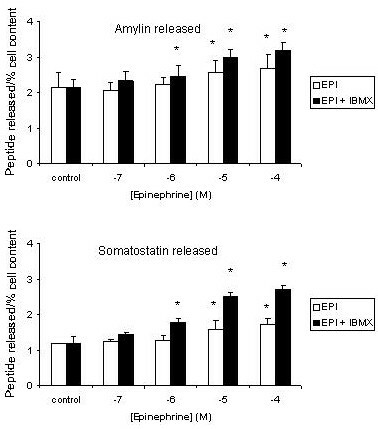 Effect of epinephrine on amylin (top) and somatostatin (bottom) release from cultured D-cells. Cells were stimulated with increasing concentrations of epinephrine (EPI) in the presence or absence of isobutylmethylxanthine 100 μM (IBMX) for 2 hours. Results expressed as % of cell content of peptide released, mean ± SEM, * P < 0.05 vs. control. Effect of glucagon-like peptide-1 on amylin (top) and somatostatin (bottom) release from cultured D-cells. Cells were stimulated with increasing concentrations of glucagon-like peptide-1 (GLP) in the presence or absence of isobutylmethylxanthine 100 μM (IBMX) for 2 hours. Results expressed as % of cell content of peptide released, mean ± SEM, * P < 0.05 vs. control. The responses to epinephrine and GLP-1 were enhanced by co-administration with the phosphodiesterase inhibitor isobutylmethylxanthine (IBMX) (100 μM). Basal amylin release was 2.0 ± 0.2% TCC and maximal IBMX-enhanced release 3.2 ± 0.2% TCC with epinephrine at 100 μM and 3.2 ± 0.3% TCC with GLP-1 at 10 nM. Basal somatostatin release (1.1 ± 0.1% TCC) increased to 2.7 ± 0.1% TCC with epinephrine + IBMX and 2.1 ± 0.4% TCC with GLP-1 + IBMX. These were still significantly less than CCK-stimulated release. There were no differences in the pattern or ratio of somatostatin and amylin responses (Figures 3 and 4). Treatment with the somatostatin analogue octreotide produced small but non-significant reductions in both basal amylin (by 14%) and basal somatostatin (by 18%) secretion (Figure 5). Carbachol had no obvious effect on either basal amylin or somatostatin secretion (Figure 5). CCK-stimulated amylin release was significantly inhibited by octreotide (by 42%) and the muscarinic agonist carbachol (by 51%). Similarly epinephrine (with IBMX)-stimulated amylin release was inhibited by 33% by octreotide and 59% by carbachol (both P < 0.05). As shown in figure 6, a similar pattern was seen with somatostatin release. Effect of octreotide and carbachol on basal amylin and somatostatin release from cultured D-cells. D-cells were stimulated with either octreotide 10 nM (OCT) or carbachol 100 μM (CBH) for 2 hours and release of amylin and somatostatin assessed. Results expressed as % of cell content of peptide released, mean ± SEM. 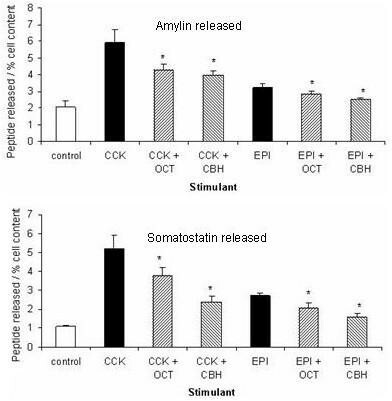 Inhibitory effects of octreotide and carbachol on agonist-stimulated amylin (top) and somatostatin (bottom) release. D-cells were stimulated with either CCK 10 nM or epinephrine with isobutylmethylxanthine both 100 μM (EPI) in combination with octreotide 10 nM (OCT) or carbachol 100 μM (CBH) for 2 hours. Results expressed as % of cell content of peptide released, mean ± SEM, * P < 0.05 vs. relevant agonist-stimulated release. This is the first study to examine the release of amylin from gastric mucosa at the cellular level. Results demonstrated that amylin was not only stored in gastric mucosal cells but also that putative physiological agonists regulated release of the peptide. Previous studies have localised amylin to the stomach using Northern blotting [31, 32], immunocytochemistry , radioimmunoassay  and in situ hybridisation  but the release of gastric amylin has not been demonstrated previously. The majority of gastric fundic amylin appears to be localised with somatostatin within D-cells  Therefore we have used the cultured rabbit D-cell model to investigate the agents controlling cellular release of amylin and to compare this to somatostatin secretion. Initial studies were performed with potent agents known to directly activate peptide secretion from endocrine cells in a receptor-independent manner  Phorbol esters (such a PMA) directly activate protein kinase C in the inner layer of the cell membrane; this in turn activates the cellular processes required for exocytosis. PMA was a potent stimulant of both somatostatin and amylin secretion. The calcium ionophore A23187, which increases levels of intracellular calcium ([Ca2+]i]) also stimulated amylin release, although it was significantly less potent than PMA. This is similar to the responses seen in human antral  and canine fundic D-cells  where it is believe the rise in [Ca2+]i is mainly facilitative rather than directly stimulating secretion. Direct activation of adenylate cyclase with forskolin also stimulated amylin release. Therefore the initial studies demonstrated that amylin release could be stimulated by activation of either of the two main intracellular signalling pathways known to enhance peptide secretion. Having determined that these pathways were active, we explored which physiological agents could stimulate amylin secretion in a receptor-dependent manner. 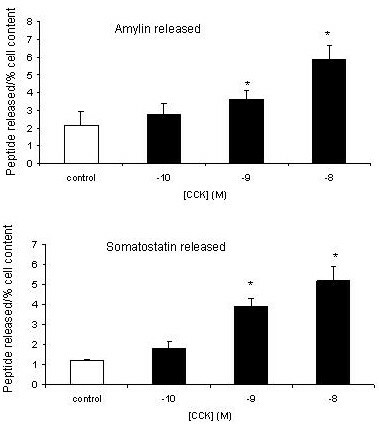 Cholecystokinin-8 produced a dose-dependent increase in amylin and somatostatin secretion. CCK is known to be a potent in vitro stimulant of somatostatin release from antral and fundic D-cells [26, 30, 34]. A similar dose response was seen for amylin, although the overall increment was slightly greater for somatostatin than amylin. Further studies will be needed to determine whether this represents a separate pool of somatostatin specifically secreted following stimulation with CCK. Fundic D-cells appear to express both the CCK-1 (CCKA) and CCK-2 (gastrin/CCKB) receptors . Activation of these receptors triggers the activation of phospholipase C, release of diacylglerol and inositol 1,4,5-trisphosphate and subsequent elevation of [Ca2+]i and activation of PKC, leading to peptide release . These results are consistent with the results for A23187 and PMA stimulation. Therefore it appears that CCK may act as a physiological stimulant of amylin release. 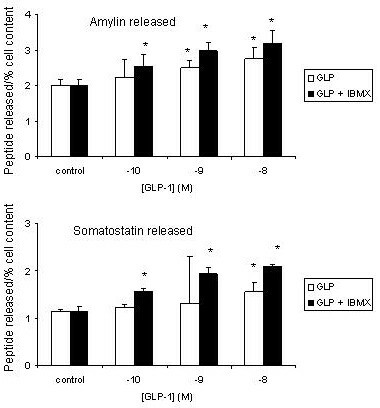 Epinephrine and GLP-1 produced small dose-dependent increases in amylin and somatostatin secretion. This effect could be enhanced by co-treatment with the phosphodiesterase inhibitor IBMX, which inhibits cAMP breakdown and amplifies responses generated by adenylate cyclase coupled receptors. However the responses were still significantly less that those seen with activation of the Ca2+/PKC pathway by either CCK or PMA. Similar differences in the sensitivities have been described in human antral  and canine fundic  D-cells. The predominant inhibitory influences described thus far on fundic D-cells are muscarinic agonists [37, 38] and autoregulation by somatostatin itself [39, 40]. The responses reported here are in keeping with the data on somatostatin release from canine fundic D-cells [30, 37]. In contrast, muscarinic receptors are stimulatory to antral D-cells , probably reflecting a specific difference in function. The current study confirmed the inhibitory actions of both the somatostatin-analogue octreotide and muscarinic agonist carbachol against somatostatin release. A similar inhibition of stimulated amylin release was seen. This suggests that in vivo inhibition of amylin release involves parasympathetic input and autocrine regulation by somatostatin. Under all conditions studied somatostatin and amylin were secreted in parallel, as may be expected if they are co-stored in secretory granules. Insulin and amylin are co-secreted from pancreatic β-cells, secretion normally occurs in parallel [42–44] but differential secretion has been reported in experiment models of diabetes mellitus [45, 46]. Further studies will be needed to further define the relationship between the secretion and actions of gastric amylin and somatostatin. In isolated pancreatic islets the two peptides appear to have a co-operative role in regulating peptide secretion: combined imunoneutralisation of amylin and somatostatin resulted in greater enhancement of insulin and glucagon secretion than neutralisation of either alone . It will be interesting to examine whether similar results are seen with gastric functions. Post-prandial release of intestinal CCK and GLP-1 inhibit gastric emptying and acid secretion [13, 47]. These effects are though to be meditated at least in part via intermediates released from the D-cell rather than by directly inhibiting the acid-secreting parietal cell . It was believed that somatostatin was the sole intermediate but the results of the current study suggest that paracrine regulation by amylin of parietal, ECL- and other endocrine cells may have a role in the integrative responses to meals. The amylin-induced inhibition of histamine released from rat fundic mucosal segments in vitro was mediated via increased somatostatin release  but using a selective somatostatin receptor antagonist Rossowski et al showed in vivo in rats that a portion of the acid-inhibitory actions of both amylin and the related peptide adrenomedullin were somatostatin-independent . The specific roles of amylin in gastric physiology require further elucidation but these data suggest that locally released amylin is directly capable of regulating mucosal functions. The responses to epinephrine and carbachol suggest that autonomic innervation can regulate the secretion of amylin. The overall balance in vivo would then depend on the relative input of the inhibitory muscarinic and stimulatory adrenergic systems, combined with circulating endocrine and local paracrine and possibly luminal factors. This study describes the initial characterisation of the factors regulating gastric amylin release. We have demonstrated that amylin release can be stimulated by receptor-dependent stimulation of either of the Ca2+/PKC and adenylate cyclase/cAMP pathways and that physiologically relevant peptides and neural mediators can enhance amylin release. This supports the hypothesis that amylin may module gastric mucosal function. This study confirms that short-term cultures of cells enriched by elutriation will provide a model for exploring the pathophysiological release of gastric amylin and provide a route of further understanding the role of amylin in regulation of gastric motor and secretory function. Matrigel was obtained from Universal Biologicals (London, UK), octreotide from Novartis (Surrey, UK) and Ham's F12/Dulbecco's modified Eagle's culture medium (50:50, v:v), glutamine, Hanks balanced salt solution and foetal calf serum were purchased from Gibco (Paisley, UK). Sulphated cholecystokinin-8 (CCK), human GLP-1 and all other reagents were obtained from Sigma (Poole, UK). Primary cultures of rabbit gastric fundic mucosal cells enriched for D-cells were obtained as described previously [39, 48]. Briefly, rabbit fundic mucosa was subjected to sequential EDTA and collagenase digestion. The resulting cell suspension was enriched for D-cells by counterflow elutatriation using a Beckman JE 5.0 standard rotor as previously described. The D-cell enriched fraction was resuspended in complete culture medium (Ham's F12/Dulbecco's modified Eagle's culture medium (50:50, v:v), containing 2 mM glutamine, 10 mM HEPES pH 7.4, 0.22% NaHCO3, 10% foetal calf serum, 1 mg/l hydrocortisone, 8 mg/l insulin, 100 mg/l penicillin, 100 mg/l gentamicin, 100 mg/l streptomycin) and cultured on Matrigel-coated 24 well tissue culture plates  at a density of 1 × 106 cells/well for 40 hours in an atmosphere of 5% CO2, 95% air at 37°C. Cultured cells were washed 3 times in release medium (Earl's balanced salt solution containing 0.1% bovine serum albumin, 10 mM HEPES pH 7.4) to remove dead and non-adherent cells. A further 1 ml of release medium was added containing test agonists and cells incubated for 2 hours at 37°C in an atmosphere of 5% CO2, 95% air. After the release period, the conditioned media was aspirated and centrifuged to remove non-adherent cells. Total cellular content of peptide was extracted by boiling in 1 ml in distilled water. Conditioned media and cell extracts were stored at -70°C until assayed for peptide content . Somatostatin concentrations were assessed by radioimmunoassay (RIA) with antiserum K2, as described previously . Half-maximal inhibition of binding occurred at 2 fmol / tube and the intra-assay and inter-assay variation were 7% and 8% percent respectively. Amylin concentrations were measured by direct ELISA (Penninsula Laboratories, Belmont, CA, USA), according to the manufacturers instructions. The assay has a range of 0.04–2 ng / ml, and intra-assay and inter-assay variation of < 5% and <14% respectively. The antibody used has 100% cross reactivity with amylin and amylin-amide but < 1% cross reactivity with CGRP and negligible reaction with other biologically active peptides. All experimental samples from a single animal preparation were assayed in the same RIA or ELISA. Peptide release during the 2-hour period was expressed as the percentage of the total cell content (TCC) of that peptide. Each experimental condition was tested in duplicate and results from a single animal preparation were regarded as N = 1. Results are expressed as the mean ± SEM of 3–6 separate animal preparations. Each 24 well plate always included control (basal) wells and positive stimulants. Peptide release by stimulants was compared to the basal release on the relevant 24 well plate. One-way analysis of variance and Student's paired t-test were used to determine significance. A P value of < 0.05 was regarded as significant. phorbol-12-myristate-13-acetate, TCC, total cell content. This work was supported in part by a Medical Research Council training fellowship for ILPB. Some of the data were presented in abstract form at the United European Gastroenterology Week in Birmingham 1997. ILPB conceived and designed the study, performed the cell isolation, culture, release experiments, immunoassays and wrote draft and final versions of the manuscript. The late JC conceived the study and co-wrote the first manuscript draft.